Bangalore is a wonderful city that has everything one could ask for. Quaint independent houses to huge skyscrapers, street food stalls to luxurious hotels, lakes, gardens, you name it! It is spread with restaurants of innumerable kinds of cuisines, friendly people and a number of places to travel to during the weekends. Parks, lakes and gardens have forever been the place that people turn to when they want to spend some quality time with their loved ones. Many quick escapes into the laps of nature, where you can breathe fresh air while pleasing your eyes with the sight of lush greenery, vibrant flowers and sometimes even a clear lake, are all around. 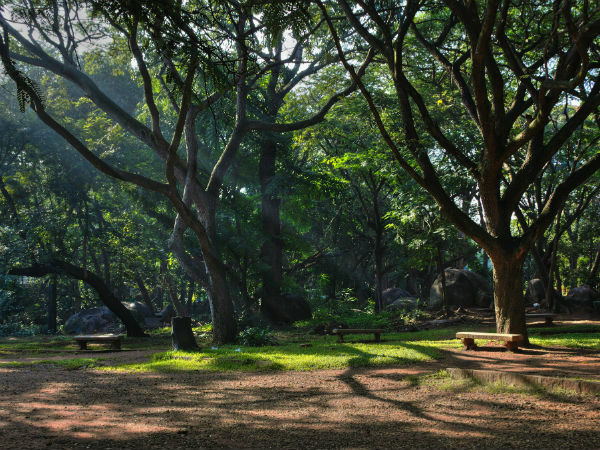 Read about the top 5 parks in Bangalore that you must visit if you want to experience one such pleasant escape. Literally known as the Red Garden, Lalbagh is a picturesque garden that was formerly commissioned by the Mysore ruler Hyder Ali and completed by his son, Tipu Sultan. This magnificent garden is the city's most favourite place of hangout for people of all ages. The garden is home to a stunning glasshouse where flower shows take place twice every year during Republic and Independence Day. Apart from being home to magnificent and exotic flowers galore, the garden also has a clear lake, ancient trees, a Japanese decorative monument, etc. The garden remains open from 6 am to 7 pm everyday. Located in the heart of the city, Cubbon Park makes for a pleasant getaway from the city hustle bustle. The park is sprawling across an area of 300 acres and consists mostly of a park with a well-paved path to walk on, bamboo thickets, outcrops of rocks, etc. You can expect to see as many as 6000 trees in this beautiful park. While the park remains open throughout the day for visitors, 5 am to 8 am is reserved for the fitness freaks, where they can go jogging, exercise or walk in the arms of nature. Buddha Shanti Kanive, which is also known as Buddha Park, is a beautiful well-planned landscape park that follows a zen garden or a Japanese rock garden theme. Located in a quaint place called Nagarbhavi, this park is a beautification of a rocky wasteland by the BBMP. Stone-carved lions, pretty and colourful bougainvillea and scenes from the life of Buddha carved on stone are some of the many intriguing things you can witness in this offbeat park. Experience watching a park full of butterflies, while also revelling in the beauty of other animals, in the Bannerghatta National Park. The Butterfly Park consists of an audio visual room, a museum and a conservatory where you can watch documentaries, learn about the life cycle of a butterfly and get a lot more information about them. For all the photography enthusiasts looking for a way to spend the weekend, head to the Butterfly Park in Bannerghatta National Park. Swaying away from the regular parks with a walkable pathway, trees and greenery dotted with colourful little flowers, the Freedom Park is situated where the Central Jail formerly existed. The park is spread with interesting attractions like a jail museum, a water fountain, ancient barracks, a watchtower, etc. The park is also a regular place of meetings, protests or rallies. The idea was inspired by the Hyde Park of London. The park remains open from 5 pm to 8 pm everyday.